When I put together a list of books that have meant a lot to me, Small Change by Susan & Larry Terkel will be on my list of money-saving, life-altering books. The Small Change formula is really excellent and the minor changes suggested--personal, financial, health, professional--are meaningful and practical. For instance, the authors suggest substituting one glass of water for a soft drink at each meal. Projected savings: 50,000 calories and $500 annually. Another easy change: walk to a further bus stop rather than the stop closest to my home. Projected benefit: I could walk an additional 150 miles in one year with a small adjusment in my route. Face it: Our little bad habits cause more grief than the occasional huge error. Here's a menu of petty little things that cost us time and money every day: misplaced keys, the extra serving of junk food, the forgotten lunch, etc. Consider my kitchen counter tops. When I cook, the kitchen looks like the aftermath of a tropical storm through Miami. My kitchen surfaces become overdone with spices, oils and garnishes. As such, clean-up takes longer, which cuts into my income and I'm less likely to cook the next meal because a) I have to find the kitchen counter tops before I can use the kitchen again and b) cleaning up from the previous meal was such a nightmare, why would I want to cook again? Let's order pizza instead! This bad habit makes it more likely for me to order an expensive take-out meal or to just zap up an easy-to-fix microwave meal, which is usually more expensive and less healthy. The small-step solution: I'll put away each ingredient and utensil as I use it. The proposed change is based on my review of a poor daily habit. This is such a great piece of advice. I learned the value of focus while deep cleaning my bedroom. When I tackle the entire room, I just waltz around in clutter. I call it the Clutter Shuffle in which I move piles from one location to the next. But when I target one section of the room at a time, that level of focus and attention delivers real results. I deeply clean and put things where they really belong. It's a mindful process, with a big payback. By the way, once the change becomes a permanent part of my routine, then it's safe to move on to the next target. The Terkels recommend making a minor change every few weeks. I've tried a one-change-a-month schedule and that seems to work for me. It's important to keep moving. Professional athletes, for example, practice and run drills. The same process applies for other professions and crafts. "Instruments tuned on a regular basis are easier to tune," the Terkels state on page 17. This step requires discipline, delayed-gratification and confidence. When I was in my 20s, I sat down to write a novel and not just any novel: I wanted to write the Great American Novel, an epic piece. I wanted immediate blockbuster success. Years later, one draft of that great effort is in a box and other drafts have been fed to the dust bunnies under my bed. This past summer, however, I completed writing a small book, which will be published this spring. I wrote it chapter by chapter, with small goals. That step-by-step process worked for me. Likewise, I have started writing a short-story collection. Maybe it could be a novel, but each little story has its own destination. And that small target is enough for me. If I enjoy the process, I'll be more likely to stick with the program. Consider my penny hunt. As I purge through the assorted piles in my home, I've made it a point to look for pennies and loose change. A bit of spare change is not going to make me richer, but the Treasure Hunt mentality brings a little joy to my clean-up efforts. It's fun to look under a couch pillow if I think I'm going to find a few silver or copper coins. Additionally, if I can laugh about myself: the messy piles, the comic cooking or the crazy shopping trips, it becomes easier to let go of bad habits and memories of poor choices. It's just another adventure. Editor's note: Sharon Harvey Rosenberg (The Frugal Duchess) will be joining Wise Bread as a full time blogger in August. In the mean time, she'll be dropping by with a few guest posts a week. 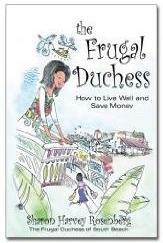 You can find more great tips from Sharon in her book Frugal Duchess: How to Live Well and Save Money or in Wise Bread's new book 10,001 Ways to Live Large on a Small Budget. Can't wait until August? Here are other great posts by Sharon on her blog The Frugal Duchess. Enjoy! I love this topic! It is so difficult to address a big issue when it is overwhelming. I need to apply this to myself and teach it in my daily work (with chronically ill people). For some reason its easier to teach the concept than DO!! I will definitely be reading this one! "Change something in your daily life and you will see the benefits steadily accumulate." Good quote here, although this is much easier said than done. Thanks for the post! If you liked this book, I recommend you check out one I read this spring called, THE POWER OF SMALL: Why Little Things Make All the Difference, by Linda Kaplan Thaler and Robin Koval. (Linda Kaplan Thaler, it turns out, wrote the jingle for Toys R Us among other things!) The book is filled with really wonderful tips and stories of how you can "think small" in order to achieve big goals. I loved it and have really been inspired by this new way of thinking. I find that if I first get out all the ingredients I need for my recipe before I start measuring and mixing and then put them back one-by-one as I use them, I end up more relaxed and with a cleaner kitchen. Just dropping by as the host of the Aug 2nd edition of the Book Reviews Blog Carnival, to let you know I've added you to the post. Another good trick is keep smaller plastic bags in a small box or jar under the sink, and when you are cooking, use one of them as a groundsheet to protect a section of the counter, and then peel and trim all your veggies onto that, as well as toss other bits that result from food prep. A good thing to spill onto, as well. Best part is when it's loaded, grab the ends and the whole mess goes neatly into the garbage. If you don't use plastic bags, a medium cutting board does the same job, but you have to wipe it rather than tossing it. I'm glad to see I'm not the only one with a messy countertop, or who engages in the Clutter Shuffle when cleaning! Thank you for this post and book recommendation. It sounds like just the book I need. This sounds like a really good book. This is something that I have recently decided to implement into my life by focusing on one habit to change every 30 days or so. Thanks for the book recommendation! You can also put down a couple of sheets of newspaper... and then put the whole thing into the compost!